Lacy embroideries worked on woven fabric. 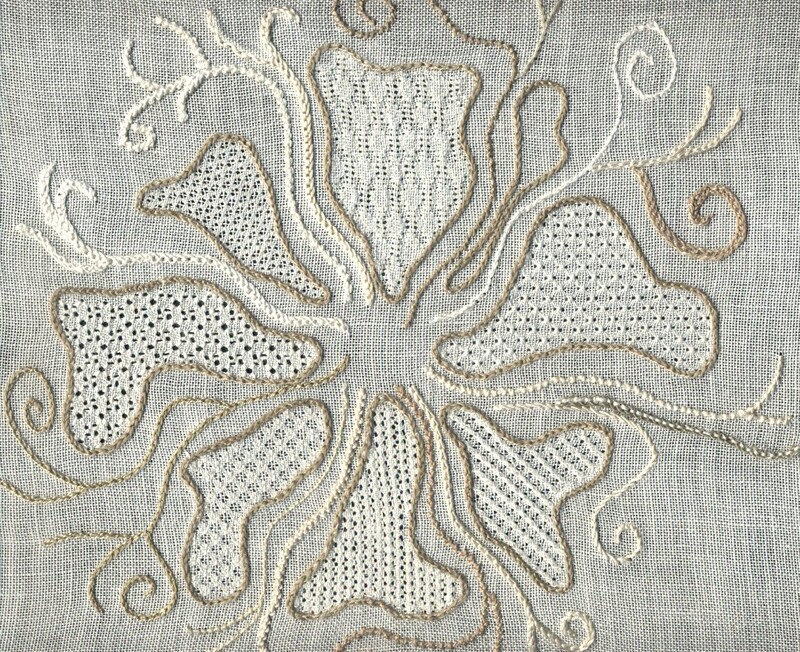 Hardanger embroidery is a form of cutwork and drawn thread work. It was originally the Norwegian version of cutwork but has become very popular among embroiderers around the world. Designs are based on empty squares and rectangles with blocks of satin stitches, called kloster blocks, to bind and secure the cut edges. Pulled thread work collects the fabric threads into clumps by stitching with strong tension, leaving a pattern of holes. No fabric threads are removed. Drawn thread work removes some fabric threads and embellishes the thinned out areas. Started by Georgia Seitz. Last reply by Lorelei Halley Administrator Nov 12, 2014. You need to be a member of Hardanger Embroidery, Pulled Thread Work and Drawn Thread Work to add comments! What a lovely mat, Robert. What a lucky sister you have,. I hope she appreciated it. This was posted today on facebook. New variegated colors in DMC floss, and presumably, pearl 5. Robert -- BEAUTIFUL. Please post it also to our PHOTOS section, so we can find it easily in the future. Paragraph 5 in this NOTE explains how to do that. My first Hardanger piece done last year for one of my sisters for Christmas. The pattern called for a Lily of the Valley design to be added but I left it out as I wanted something she could put a vase on...that would not distract from the other work. Hardanger is great fun. I enjoy it, too. I have been doing Hardanger since around 1988 or so. I have some things in Pinterest. I would like to invite all of you to attend the I.O.L.I. convention in July at Coralville, Iowa. We have asked Debi Feyh to teach Hardanger classes. Debi has worked for Nordic Needle and recently became one of the new owners. Debi's morning class is "Hardanger Pie". Students have the choice of "pecan, cherry or blueberry"! Her afternoon class is "Prairie Bouquet". On Thursday her class is "Elegant Adornments" which are two-sided ornaments. For details: I.O.L.I. 2015 classes. Now i feel i have this in the right place, just scroll down and you will see the cut or pulled thread work. So many laces to make and the days fly past so fast.